What is Gluten Free Abroad? Gluten Free Abroad is a free and interactive website project created as a tool to aid users in making informed decisions about gluten-free dining, accommodation, shopping, and services, as well as household cooking. As a result, its growth relies heavily on member contributions of new listings, events, services, comments, and reviews. This creates a richness of information that is completely localized and organized by city, together with local interactive maps, therefore making it a unique resource for use both at home and while travelling. The project is a combination of website and blog, chosen to balance the practical with the personal. It is in continuous update and expansion. The website portion is a neutral forum of information added collectively by members, and membership is always free of charge. It contains an interactive local maps of dining, accommodation, and shopping locations, as well as a directory of services. Local place and event listings contain photos, directional maps, comments, and a comprehensive rating system based on various criteria that aim to give complete and objective evaluations. Listings are always added free of charge and on a completely voluntary basis. Any website member can add a listing, event, or service that they know of, and owners can correct and update information using the ownership module. The blog portion of the project is a collection of personal and informative articles, recipes, lifestyle tips, travel guides, and itineraries that reflect various subjects of interest regarding gluten-free lifestyle, both inside and outside the home. It provides a point of candid exchange of comments and experiences. When Julia and Daniele met, Julia had just returned to Italy after having eliminated gluten from her life. She was basically eating three things, meat, vegetables, and rice, as she got her bearings on how to eat safely in that land of bread and pasta, and almost always ate at home. Theirs was pretty much a love-at-first-sight story, with the bonus that the Italian did not seem put out in the least that the American couldn’t eat traditional pasta. In fact, he never really accepted that there was anything she couldn’t eat and instead simply made everything gluten-free, starting with the gluten-free pizza he made for her on their first date: his own birthday party! Along with regular courtship, their earliest moments were spent figuring out how to have a gluten-free lifestyle without limits. In their life and marriage, they have since created a home and social lifestyle in which gluten is the exception and Julia often forgets that she is different, thanks largely to Daniele wanting to participate and eat almost exclusively the way she does. Actually, Julia usually has to do some serious convincing when she wants Daniele to try and describe some new dish for her that she can’t have when they eat out. The only time gluten really presents itself is in fact when they eat out. Since Daniele and Julia share passions of travel and cooking, they often find themselves in a new place sampling some new dish. This is when it gets tricky, because though they do heavy research ahead of time and a lot of explaining on-site, they have found there are too few practical resources that give you objective, reliable, and comprehensive information on eating out gluten free. They wanted an idea of what to expect, or tips and advice on the gluten-free scene in a given location, both from travellers and locals, especially since food, after all, is a basic necessity. So they decided basta, enough! We want a place where we can share our own experiences and advice while learning from those of others. The goal is that, little by little, eating out gluten-free can become as matter-of-fact as eating in gluten-free. And so the idea of Gluten Free Abroad was born as a practical gluten-free lifestyle guide to dining out and eating in, locally and globally. Julia is a licensed tour guide and Art History lecturer. Though born in New York, she currently lives in Italy with her husband Daniele, who shares her passions of cooking and travel. The two of them divide their time between Florence where they work and the Mugello countryside where they help out on the family’s organic farm. 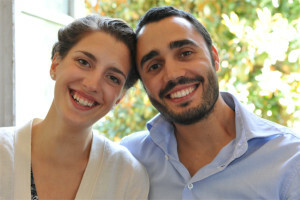 The Gluten Free Abroad Blog is their creative space: a reflection of Julia’s love of writing about food and travel, Daniele’s love of photography (he shoots the photos for the blog articles and recipes), and their love of cooking in the kitchen together. They prefer cooking and baking with simple, seasonal, wholesome ingredients and flours, often organic, and like to use cooking as a way to quench their thirst for experiencing new cultures when they are not actually on-the-go themselves. They are especially happy when family and friends are at their table, too.